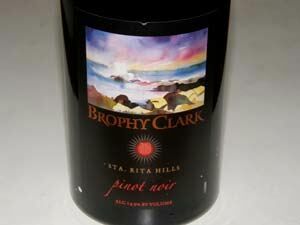 This is my first meeting with the Pinot Noirs of Brophy Clark. Husband and wife team of John and Kelly Clark have been crafting small lots of Pinot Noir since 1996 from vineyards in Santa Barbara County. Between her time as a viticulturist and his as a winemaker, the two have more than fifty years of combined experience making Central Coast wines. Annual production is about 10,000 cases spread among Pinot Noir, Chardonnay, and a few other varietals. The wines are solid and represent good value.